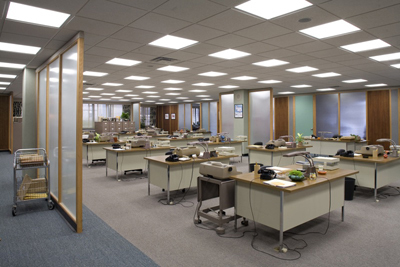 From the photo above, turns out he’d not only seen the movie, but he and his writing staff used the book as research, and then inserted into an episode in Season 2. 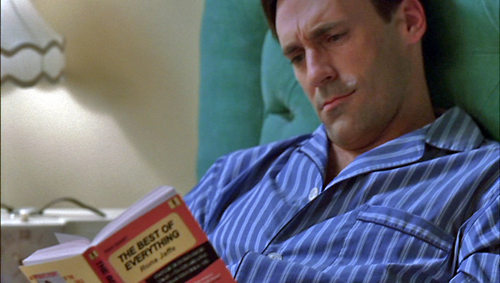 Betty Draper walks into the bedroom, where Don is reading a paperback copy of Rona Jaffee’s The Best of Everything. BETTY It’s better than the Hollywood version. BETTY Joan Crawford is not what she was. You know, honestly, I found her eyebrows completely unnerving. Like a couple of caterpillars pasted there. Her standing next to Suzy Parker as if they were the same species. DON Well, some men like eyebrows, and all men like Joan Crawford. Salvatore couldn’t stop talking about her. Trash talking Miss Crawford? Another reason why I dislike Betty, and this moves to #1 on the list. At least Don told her what for!